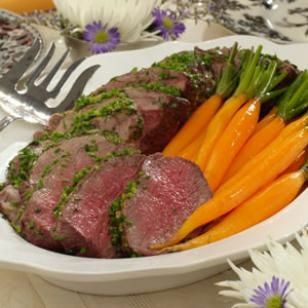 Rub the Extra Virgin Olive Oil over the entire surface of the roast, making sure all the meat has a light coating of oil. In a coffee mill, grind all the remaining ingredients until ground fine. When totally ground, rub the spice mixture into the roast thoroughly, making sure you work it into the meat just a bit. Insert a remote temperature probe directly into the center of the roast. If the roast is a bone in rib roast, avoid pushing the probe against or inbetween the rib bones. Place the roast on a rack in a low side pan and place in the center of the over. (The probe cable will come out of the door side and into the remote unit.) Roast the beef, uncovered, for about 15-20 minutes per pound, or until the meat thermometer reads about 120-122 degrees. That should be a rare roast beef. If you want it rarer, like I do, stop the roasting process a few degrees earlier. Allow the roast to "rest" for about 15-20 minutes before carving. Serve with REAL horseradish. Beef Sicilian Style is a fairly simple and straightforward dish. I use a coffee mill to make sure that all the spices, etc, are ground finely before rubbing them into the roast. My mother, and her forebears, did not have the luxury of such a device and used a rolling pin to crush the condiments . . . time consuming and not too effective. But the flavor was equally outstanding! I make this for myself, periodically, and save the left overs for another meal.